Bangkok in particular and Thailand in general are well known for their road mishaps, bicycle riders will need to keep this in mind. Unknown roads, reckless automobile drivers and even under-aged drivers are not uncommon here. Taking part in a well arranged and promoted cycle race would be quite safe but, ride on your own or with a group of friends and you will need to be very careful. Experienced cyclists have met a sad end in the country, so do not get carelessness overcome you. You need the basics, bicycle lights, a decent helmet, bright colored T-shirts etc but, you will also need a significant dose of good luck. In this report we will share some valuable information with you, just don't presume that experience taught you everything - Thailand is known for its amazing bag of surprises and some of these can be quite dangerous. The 'I am right so have nothing to fear' attitude will just not work, you want to be safe so play defensive. The image in this report was taken at a local Bike Festival, the bicycle is connected to a range of gadgets and is details are displayed on the television set. You also have a simulated scenery that keeps displaying on the big screen. Compare this to the cycling machine that we would use in a fitness center and you will better understand. Do not presume that all or most drivers are disciplined and will follow driving conventions. If you happen to be driving on the leftmost lane, beware of parked car doors opening on you. Inexperienced and rash drivers abound in Thailand, under-age driving is not very rare. Unless it is an organized race, do not try to compete with anyone driving on the road. If something goes wrong, do not get into heated arguments, guns and knives might appear. Big and expensive sports cars are owned by the rich and powerful, they might not fear the law. Make sure that you have working lights fixed on your bicycle, bells and whistles might be useless. A sturdy helmet and bright clothing will be of help, but defensive riding is your best bet. At crossings it is common for cars and motor cycles to drive without following the lights. Move out of Bangkok and school children as young as 10-12 years drive motor cycles. Keep a watch for pits and holes on the road, slopes and sharp curves pose higher risk. If you plan to ride a bicycle often, consider forming a group and include some locals too. The sun and heat can be punishing, make sure that you stay hydrated, carry some wet towels. Take care of your bike, stealing bikes is common as no clear parking facilities exist. Do not answer phone calls, send messages or read online messages when bicycling. If you must make a call or receive one, stop riding move away from the road and do it. After reading the above information you might feel that, Bangkok is not very safe place for bicycle riding - you are right, sharing the road with its notorious traffic is quite a challenge. The possibility of a problem will obviously increase if you ride very often or every day. Keeping the road safety records of Thailand in perspective, cycling on the road might not be a safe way to exercise. Night time and rainy conditions can pose additional problems, avoid such situations and play safe. There not not many recreational parks in Bangkok, space is scarce and expensive. Some parka do allow cyclists, so check for one in your locality. 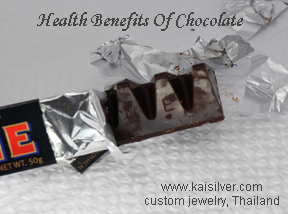 Is chocolate good for your health, what is dark chocolate and why is it considered to be healthier as compared to the more popular creamy milk chocolate ... more. 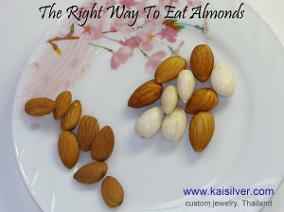 Should almonds be eaten with the skin on, what is the easiest way to take the skin of an almonds. What health benefits do almonds deliver, get the answers ... more.